For most adults, dehydration is a problem with a quick fix: Grab a glass of water or a sports drink and you’re off. But for older adults, dehydration is the most common fluid and electrolyte problem and one that can have devastating long-term effects. As O’Connor explains, people often rely on thirst as a signal for how much to drink. But at an advanced age, this may not be an accurate indicator of the body’s fluid needs. “Many older adults deliberately restrict their fluid or beverage intake if they are suffering from incontinence or are embarrassed about having to use the restroom many times a day,” O’Connor says. “They also may be confused and/or suffer from dementia and not be able to remember if they’ve consumed any beverages in a given day.” Also, older adults living alone at home or in nursing facilities may not have the mobility to get beverages by themselves and may be embarrassed to ask for help. What’s more, some medications may affect fluid status or intake, and healthcare professionals may be unaware that a patient’s fluid intake has declined. Signs and symptoms of dehydration in older adults include confusion and weakness, which are among the first symptoms to occur in severe dehydration. Other symptoms include dark urine, decreased skin elasticity, headache, dry mouth, fatigue and lethargy, a sudden change in blood pressure upon standing up, dizziness, and increased heart rate. If the population you are working with includes those with dementia or Alzheimer’s, who are normally confused or forgetful, extra diligence in monitoring for dehydration is necessary. For older adults, healthcare providers should remind them that fluids will decrease pain, keep them more alert, reduce constipation, and keep them out of the hospital. Healthcare providers may not have adequate knowledge of fluid requirements and the signs and symptoms of dehydration. That’s where education and ongoing diligence come in. 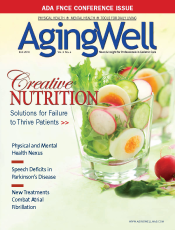 “Healthcare providers should prompt older adults to drink between meals, especially with the cognitively impaired. They can offer beverages that the older adult enjoys,” Natt says. “Water should always be in reach throughout the day.” Also encourage fluid intake while brushing teeth, supervise during meals, and instruct family members and other older adult care providers about strategies to ensure proper fluid intake. Create a schedule for taking fluids, such as care planning. For example, an older adult at risk can drink a cup of a beverage every time he or she urinates. Regularly providing and offering beverages over the course of the day is also essential to preventing dehydration, and a variety of fluids should be offered at all meals, between meals, and at all medication administrations. Older adults also may need adaptive equipment, such as cups with handles, straws, or spouted cups in order to drink. Ensuring that these items are readily available may help increase their fluid intake. Daughters of Israel has a hydration program with a variety of beverages and offers activities that include drinks in their programs. It’s also standard practice to include soups and seasonal fruits with high water content with meals, and for older adults to have a glass of water waiting in the dining room at each mealtime. Dietitians recommend using the smaller “kid-size” bottles of water that older adults may carry around or keep by their beds or chairs. Offering smaller amounts often seems less overwhelming, and elders may be more apt to drink the smaller quantities than from a larger bottle of water. Jo Anne Brown, RD, of Vi (formerly Classic Residence by Hyatt), a provider of senior living communities, says variety is key when it comes to enticing older adults to drink. “Change it up,” she says. “Put a little lemon in water to make it taste better. Try offering coffee, tea, and juice breaks.” Look for refreshing fluids that don’t jeopardize other medical concerns, such as those containing excessive calories, sugar, salt, and/or potassium. Make sure the fluids older adults consume work into a healthful diet and are readily available. RDs and other healthcare practitioners should keep in mind that many foods, particularly fruits and vegetables, have significant water content. Strive to include one or two of these foods at each meal to help increase fluid intake. Some examples include grapefruit, honeydew, strawberries, raw tomatoes, watermelon, raw celery, cooked asparagus, and raw or cooked broccoli. O’Connor says RDs, as part of their nutritional assessments and evaluations, generally include a recommended daily fluid intake. “This information needs to be conveyed to all staff caring for any older adult (nurses, nurses’ aides, dietary staff, physicians, activities coordinators, etc), as all of these healthcare team members can help to ensure the older adult reaches their goal of having adequate fluid intake daily,” she says. There may be a need for some sort of checklist, whether it is used by staff members or the patient, to ensure that fluid status is consistently maintained as necessary.